Do you enjoy working in a clean and safe (smoke free, drug free) environment with advancement opportunities? Ali at Olive Auto Center hires long-term minded prospects who are goal oriented and have a full appreciation of working in a family atmosphere with personal loyalty. He cares about his employees and considers them family! If you believe you are a good fit, please send your resume to [email protected]. 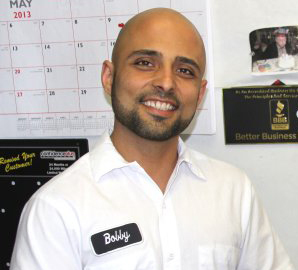 My name is Bobby and I am the Service Writer and Manager at Olive Auto Center. Ali, the owner, hired me here at Olive Auto in Febuary of 2013. During my interview with him he made it very clear that he was looking for someone to grow with, help him grow his business, and in return he would return the favor. Well now it has been approximately 15 months and he has definitely met my expectations as an employee and he has kept his promise. A week vacation paid, insurance, and a raise in my salary. He has also been the most understanding boss I have ever had. I feel very appreciative to be a part of this team. Also he made it very clear that he wanted a clean work environment. Ali and I have always worked to make our work place as easy going and as honest as possible. Today we have won Angie's List 5 star customer satisfaction 3 years in a row and on Yelp we have more reviews than any other shop in Burbank and we're a 4 star. I wish I started working for him way before I started working for other shops.